I love shopping online, I mean who doesn't. For one it's more affordable than regular stores, more importantly it's convenient and saves time. One online store that I really like is Notino. If you haven't read my previous posts on them, I'll explain to you. Their an affordable online store that has a variety of products. From hair to makeup to SkinCare, you name it! I decided to make this wishlist inspired by the Summer. So keep reading to see what's on my wishlist. When I find a product that I like, I usually stick to it. 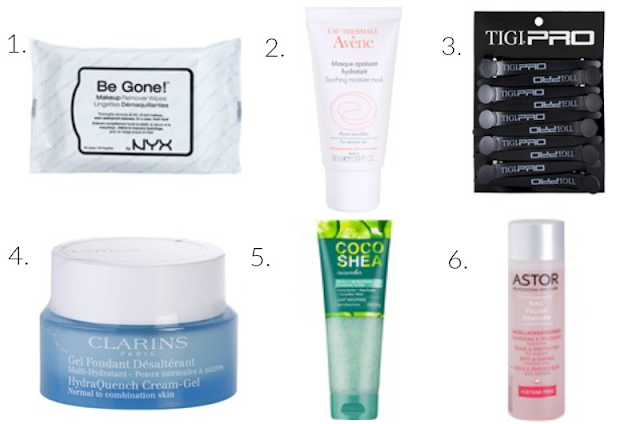 The NYX Cleansing Wipes is my favorite thing to use for removing my makeup. I am definitely going to be repurchasing this product. It doesn't leave my skin feeling sticky or greasy. During the Summer months parts of my gets dry. I'm looking for a product that will help my skin feel soft and erase the redness that I experience. The Avène soothing and hydrating mask seems like a good product to help with all my problems. When working on my hair, it tends to become a messy process. My hair is either clumped together or all over my face. So I can't wait to use these clips. They are used for sectioning the hair in different parts. This will help me moisturized each part of my and ensure that I don't leave any section out. My hair tends to get dry during the Summer. If you're like me, then your skin isn't just in one category. I have a combination of dry and oily skin. This is so annoying because for the most part it's hard to find a product that works for both problems. So when I found the Clarins HydraQuench Cream Gel, I knew I wanted to try this out. I love using body scrubs! Not only are they great for exfoliating, but the results are smooth soft skin. So I would love to try this cucumber body scrub. When I think of cucumbers, I feel calm and relaxed. Most importantly it would be great for a pamper day! I recently started paying attention to things that are in the products, I use. So while doing some research I learned that Acetone is not good for you. Using remover with Acetone will dry your cuticles. So I will be purchasing Acetone free remover. I hope you enjoyed reading my Summer wishlist and make sure you check out Notino. What's on your wishlist?